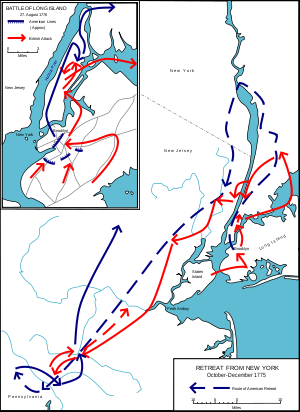 The New York and New Jersey campaign was a series of battles in 1776 and the winter months of 1777 for control of New York City and the state of New Jersey during the American Revolutionary War between British forces under General Sir William Howe and the Continental Army under General George Washington. Howe was successful in driving Washington out of New York City, but overextended his reach into New Jersey, and ended the active campaign season in January 1777 with only a few outposts near the city. The British held New York harbor for the rest of the war, using it as a base for expeditions against other targets. First landing unopposed on Staten Island on July 3, 1776, Howe assembled an army composed of elements that had been withdrawn from Boston in March following their failure to hold that city, combined with additional British troops, as well as Hessian troops hired from several German principalities. Washington had New England soldiers as well as regiments from states as far south as Virginia. Landing on Long Island in August, Howe defeated Washington in the largest battle of the war, but the Continental Army was able to make an orderly retreat to Manhattan under cover of darkness and fog. Washington suffered a series of further defeats in Manhattan, with the exception of the skirmish at Harlem Heights, and eventually withdrew to White Plains, New York. At that point Howe returned to Manhattan to capture forces Washington had left in the north of the island. Washington and much of his army then crossed the Hudson River into New Jersey, and retreated all the way across the Delaware River into Pennsylvania, shrinking due to ending enlistment periods, desertions, and poor morale. Howe ordered his troops into winter quarters in December, establishing a chain of outposts from New York to Burlington, New Jersey. Washington, in a tremendous boost to American morale, launched a successful strike against the Trenton garrison after crossing the icy Delaware River, prompting Howe to withdraw his chain of outposts back to New Brunswick and the coast near New York, while Washington established his winter camp at Morristown. During the remaining winter months, both sides skirmished frequently as the British sought forage and provisions. Britain maintained control of New York City and some of the surrounding territory until the war ended in 1783, using it as a base for operations elsewhere in North America. In 1777, General Howe launched a campaign to capture Philadelphia, leaving General Sir Henry Clinton in command of the New York area, while General John Burgoyne led an attempt to gain control of the Hudson River valley, moving south from Quebec and failed at Saratoga. Northern New Jersey was the scene of skirmishing between the opposing forces for the rest of the war. When the American Revolutionary War broke out in April 1775, British troops were under siege in Boston. They defeated Patriot forces in the Battle of Bunker Hill, suffering very high casualties. When news of this expensive British victory reached London, General William Howe and Lord George Germain, the British official responsible, determined that a "decisive action" should be taken against New York City using forces recruited from throughout the British Empire as well as troops hired from small German states. General George Washington, recently named by the Second Continental Congress as the commander-in-chief of the Continental Army, echoed the sentiments of others that New York was "a post of infinite importance", and began the task of organizing military companies in the New York area when he stopped there on his way to take command of the siege of Boston. In January 1776, Washington ordered Charles Lee to raise troops and take command of New York's defenses. Lee had made some progress on the city's defenses when word arrived in late March 1776 that the British army had left Boston after Washington threatened them from heights south of the city. Concerned that General Howe was sailing directly to New York, Washington hurried regiments from Boston, including General Israel Putnam, who commanded the troops until Washington himself arrived in mid-April. At the end of April, Washington dispatched General John Sullivan with six regiments to the north to bolster the faltering Quebec campaign. General Howe, rather than moving against New York, withdrew his army to Halifax, Nova Scotia, and regrouped while transports full of British troops, shipped from bases around Europe and intended for New York, began gathering at Halifax. In June, he set sail for New York with the 9,000 men assembled there, before all of the transports arrived. German troops, primarily from Hesse-Kassel, as well as British troops from Henry Clinton's ultimately unsuccessful expedition to the Carolinas, were to meet with Howe's fleet when it reached New York. General Howe's brother, Admiral Lord Howe, arrived at Halifax with further transports after the general sailed, and immediately followed. When General Howe arrived in the outer harbor of New York, the ships began sailing up the undefended Narrows between Staten Island and Long Island on July 2, and started landing troops on the undefended shores of Staten Island that day. Washington learned from prisoners taken that Howe had landed 10,000 men, but was awaiting the arrival of another 15,000. General Washington, with a smaller army of about 19,000 effective troops, lacked significant intelligence on the British force and plans, and was uncertain exactly where in the New York area the Howes intended to strike. He consequently split the Continental Army between fortified positions on Long Island, Manhattan and mainland locations, and also established a "Flying Camp" in northern New Jersey. This was intended as a reserve force that could support operations anywhere along the New Jersey side of the Hudson. The Howe brothers had been granted authority as peace commissioners by Parliament, with limited powers to pursue a peaceful resolution to the conflict. King George III was not optimistic about the possibility of a peace, "yet I think it right to be attempted, whilst every act of vigour is unremittingly carried on". Their powers were limited to granting of "general and special pardons" and to "confer with any of his Majesty's subjects". On July 14, pursuant to these powers, Admiral Howe sent a messenger with a letter addressed to "George Washington, Esq." across the harbor. Washington's adjutant, Joseph Reed, politely informed the messenger that no person with that title was in their army. Admiral Howe's aide wrote that "the Punctilio of an Address" should not have prevented the letter's delivery, and Howe was said to be visibly annoyed by the rejection. A second request, addressed to "George Washington, Esq., etc." was similarly rejected, although the messenger was told that Washington would receive one of Howe's adjutants. In that fruitless meeting, held July 20, Washington pointed out that the limited powers the Howe brothers had been given were not of much use, as the rebels had done no wrong requiring an amnesty. In late August, the British transported about 22,000 men (including 9,000 Hessians) from Staten Island to Long Island. In the Battle of Long Island on August 27, 1776, the British outflanked the American positions, driving the Americans back to their Brooklyn Heights fortifications. General Howe then began to lay siege to the works, but Washington skillfully managed a nighttime retreat through his unguarded rear across the East River to Manhattan Island. Howe then paused to consolidate his position and consider his next move. During the battle, the British had captured General John Sullivan. Admiral Howe convinced him to deliver a message to Congress in Philadelphia, and released him on parole. Washington also gave his permission, and on September 2 Sullivan told the Congress that the Howes wanted to negotiate, and had been given much broader powers to treat than those they actually held. This created a diplomatic problem for Congress, which did not want to be seen as aggressive, which is how some representatives felt a direct rejection of the appeal would appear. Consequently, Congress agreed to send a committee to meet with the Howes in a move they did not think would bear any fruit. On September 11, the Howe brothers met with John Adams, Benjamin Franklin, and Edward Rutledge in the Staten Island Peace Conference. It had exactly the outcome the Americans expected. Lord Stirling leading an attack against the British in order to enable the retreat of other troops at the Battle of Long Island, 1776. Painting by Alonzo Chappel, 1858. During this time, Washington, who had previously been ordered by Congress to hold New York City, was concerned that he might have escaped one trap for another, since the army was still vulnerable to being surrounded on Manhattan. To keep his escape routes open to the north, he placed 5,000 troops in the city (which then only occupied the lower portion of Manhattan), and took the rest of the army to Harlem Heights. In the first recorded use of a submarine in warfare, he also attempted a novel attack on the Royal Navy, launching Turtle in a failed attempt to sink HMS Eagle, Admiral Howe's flagship. On September 15, General Howe landed about 12,000 men on lower Manhattan, quickly taking control of New York City. The Americans withdrew to Harlem, where they skirmished the next day, but held their ground. Rather than attempting to dislodge Washington from his strong position a second time, Howe again opted for a flanking maneuver. Landing troops with some opposition in October in Westchester County, he sought once again to encircle Washington. To defend against this move, Washington withdrew most of his army to White Plains, where after a short battle on October 28 he retreated further north. This isolated the remaining Continental Army troops in upper Manhattan, so Howe returned to Manhattan and captured Fort Washington in mid November, taking almost 3,000 prisoners. Four days later, November 20, Fort Lee, across the Hudson River from Fort Washington, was also taken. Washington brought much of his army across the Hudson into New Jersey, but was immediately forced to retreat by the aggressive British advance. General Howe, after consolidating British positions around New York harbor, detached 6,000 men under the command of two of his more difficult subordinates, Henry Clinton, and Hugh, Earl Percy to take Newport, Rhode Island (which they did without opposition on December 8), while he sent General Lord Cornwallis to chase Washington's army through New Jersey. The Americans withdrew across the Delaware River into Pennsylvania in early December. The outlook of the Continental Army—and thus the revolution itself—was bleak. "These are the times that try men's souls", wrote Thomas Paine in The American Crisis. Washington's army had dwindled to fewer than 5,000 men fit for duty and would be significantly reduced after enlistments expired at the end of the year. Spirits were low, popular support was wavering, and Congress had abandoned Philadelphia, fearing a British attack. Washington ordered some of the troops that returned from the failed invasion of Quebec to join him, and also ordered General Lee's troops, which he had left north of New York City, to join him. Lee, whose relationship with Washington was at times difficult, made excuses and only traveled as far as Morristown, New Jersey. When Lee strayed too far from his army on December 12, his exposed position was betrayed by Loyalists, and a British company led by Lieutenant Colonel Banastre Tarleton surrounded the inn where he was staying and took him prisoner. Lee's command was taken over by John Sullivan, who finished marching the army to Washington's camp across the river from Trenton. A hand-drawn period sketch depicting the locations of British outposts in New Jersey. Orientation is with north to the right. The capture of Lee presented the Howes with a problematic prisoner. As with a number of other Continental Army leaders, he had previously served in the British Army. Because of this the Howes at first treated him as a deserter, with threats of military punishment. However, Washington intervened, tying the treatment of Lee to the treatment of prisoners he held. Lee was ultimately treated well, and apparently offered the British commanders advice on how to win the war. Because the Americans did not have a prisoner of comparable rank, Lee remained a prisoner in New York until 1778, when he was exchanged for Richard Prescott. The failure of the Continental Army to hold New York also brought about a rise in Loyalist activity, as the city became a haven for refugee supporters of the Crown from elsewhere across the region. The British therefore actively recruited in New York and New Jersey to build regiments of provincial militia, with some success. Loyalists in these areas may have been motivated by seeing elements of the rebel army head home after their enlistments ended. One New York Patriot militia leader wrote that thirty of his men, rather than reenlisting with him, had instead signed up with the enemy. On November 30 Admiral Howe offered amnesty to anyone that had taken up arms against the Crown, provided they swore an oath to it. Washington responded with his own proclamation suggesting that those who did not renounce such oaths should immediately go behind British lines. As a result, New Jersey became a civil battlefield, with militia activity as well as spying and counterspying continuing for the rest of the war. News of the capture of New York was favorably received in London, and General Howe was awarded the Order of the Bath for his work. Combined with news of the recovery of Quebec, circumstances suggested to British leaders that the war could be ended with one more year's campaigning. News of Admiral Howe's amnesty proclamation was met with some surprise, as its terms were more lenient than the hardliners in the government expected. Politicians opposed to the war pointed out that the proclamation failed to mention the primacy of the Parliament. Furthermore, the Howes were criticized for failing to keep Parliament informed of the various peace efforts they embarked on. [Howe] shut his eyes, fought his battles, drank his bottle, had his little whore, advised with his counsellors, received his orders from North and Germain (one more absurd than the other). With the campaign at an apparent conclusion for the season, the British established a chain of outposts in New Jersey stretching from Perth Amboy to Bordentown, and entered winter quarters. They controlled New York harbor and much of New Jersey, and were in a good position to resume operations in the spring, with the rebel capital of Philadelphia in striking distance. Howe detached General Clinton with 6,000 men to occupy Newport, Rhode Island as a base for future operations against Boston and Connecticut (Clinton occupied Newport in early December without opposition.) Howe then sketched a campaign for the following year in a letter to Lord Germain: 10,000 men at Newport, 10,000 for an expedition to Albany (to meet an army descending from Quebec), 8,000 to cross New Jersey and threaten Philadelphia, and 5,000 to defend New York. If additional foreign forces were available, operations could also be considered against the southern states. While worrying over how to hold his army together, Washington organized attacks on the relatively exposed British outposts, which were as a result continually on edge due to ongoing militia and army raids. German commanders Carl von Donop and Johann Rall, whose brigades were at the end of the chain of outposts, were frequent targets of these raids, but their repeated warnings and requests for support from General James Grant were dismissed. Emanuel Leutze's 1851 painting Washington Crossing the Delaware is an iconic image of American history. Beginning in mid-December, Washington planned a two-pronged attack on Rall's outpost in Trenton, with a third diversionary attack on Donop's outpost in Bordentown. The plan was aided by the fortuitous presence of a militia company that drew Donop's entire 2,000-man force away from Bordentown to the south that resulted in a skirmish at Mount Holly on December 23. The consequence of this action was that Donop was not in a position to assist Rall when Washington's attack on Trenton took place. On the night of December 25–26, Washington and 2,400 men stealthily crossed the Delaware and surprised Rall's outpost the following morning in a street-to-street battle, killing or capturing nearly 1,000 Hessians. This action not only significantly boosted the army's morale; it also brought Cornwallis out of New York. He reassembled an army of more than 6,000 men, and marched most of them against a position Washington had taken south of Trenton. Leaving a garrison of 1,200 at Princeton, Cornwallis then attacked Washington's position on January 2, 1777, and was three times repulsed before darkness set in. During the night Washington once again stealthily moved his army, going around that of Cornwallis with the intention of attacking the Princeton garrison. Hugh Mercer, leading the American advance guard, encountered British soldiers from Princeton under the command of Charles Mawhood. The British troops engaged Mercer and in the ensuing battle, Mercer was mortally wounded. Washington sent reinforcements under General John Cadwalader, which were successful in driving Mawhood and the British from Princeton, with many of them fleeing to Cornwallis in Trenton. The British lost more than one quarter of their force in the battle, and American morale rose with the victory. The defeats convinced General Howe to withdraw most of his army from New Jersey, only leaving outposts at New Brunswick and Perth Amboy. Washington entered winter quarters at Morristown, having retaken most of the state from the British. However, provisions for both armies were limited, and commanders on both sides sent out parties to forage for food and other supplies. For the next few months, they engaged in a forage war, in which each targeted the foraging parties of the other. This led to numerous skirmishes and minor confrontations including the Battle of Millstone. The British also sniped with each other over the subject of provisions. Lord Percy resigned his command after a series of disagreements with Howe came to a head over the ability of the Newport station to provide forage to the New York and New Jersey forces. The British gained control of New York harbor and the surrounding agricultural areas, and held New York City and Long Island until the war ended in 1783. The Americans suffered significant casualties and lost important supplies, but Washington managed to retain the core of his army and avoid a decisive confrontation that could have ended the war. With the bold strokes of Trenton and Princeton, he had regained initiative and boosted morale. The areas around New York City in New York, New Jersey, and Connecticut were an ongoing battleground for the rest of the war. The early reports that General Howe sent to his superiors in London concerning the battles at Trenton and Princeton attempted to minimize their significance, blaming Rall for Trenton, and trying to recast Princeton as a nearly successful defense. Not everyone was fooled by his accounts, in particular Lord Germain. In a letter to the Hessian General Leopold Philip von Heister Germain wrote that "the officer who commanded [the forces at Trenton] and to whom this misfortune is to be attributed has lost his life by his rashness." Heister in turn had to report the loss to his ruler, Frederick II, Landgrave of Hesse-Kassel, with the news that not only had an entire brigade been lost, but sixteen regimental colors and six cannon as well. The news reportedly enraged Frederick, who broadly suggested that Heister return home (which he did, turning over command of the Hessian forces to Wilhelm von Knyphausen). Frederick also ordered extensive inquiries into the events of 1776, that took place in New York from 1778 to 1782. These inquiries created a unique archive of materials about the campaign. The news of Washington's successes reached Paris at a critical time. Britain's ambassador to France, Lord Stormont, was preparing complaints to France's foreign minister, the Comte de Vergennes, concerning the semi-secret financial and logistical support France had been giving to the rebels. Stormont had learned that supplies bound for America were to be shipped under French flags, where they had previously sent under American colors. He wrote that the French court was extremely happy with the news, and that the French diplomatic position noticeably hardened: "that M. de Vergennes is hostile in his heart and anxious for the success of the Rebels I have not a shadow of a doubt." The British planned two major operations for the 1777 campaign season. The first was an ambitious plan to gain control of the Hudson River valley, whose central thrust was a move along Lake Champlain by the army from Quebec under General John Burgoyne. Execution of this plan ultimately failed, ending with the surrender of Burgoyne's army at Saratoga, New York, in October. The second operation was General Howe's plan to take Philadelphia, which, after a difficult start, met with success in September. Washington's strategy in 1777 continued to be a basically defensive one. He successfully fended off an attempt by Howe to draw him into a general engagement in northern New Jersey, but was unable to prevent Howe's later success taking Philadelphia. He did send material help to General Horatio Gates, who was tasked with defending against Burgoyne's movements. Major General Benedict Arnold and Daniel Morgan's riflemen all played a notable role in the defeat of Burgoyne, following which France entered the war. In the urban environments of Manhattan, Brooklyn, and Trenton there are plaques and other memorials placed to commemorate the actions that took place in and around those locations. The Princeton Battlefield and Washington's Crossing are National Historic Landmarks, with state parks also preserving all or part of the locations where events of this campaign occurred in those areas. Morristown National Historical Park preserves locations occupied by the Continental Army during the winter months at the end of the campaign. When the illustrious part that your Excellency has borne in this long and arduous contest becomes a matter of history, fame will gather your brightest laurels rather from the banks of the Delaware than from those of the Chesapeake. Fischer, David Hackett (2004). Washington's Crossing. New York: Oxford University Press. ISBN 0-19-517034-2. OCLC 53075605. Winner of the 2005 Pulitzer Prize for History. Fredriksen, John C (2001). America's military adversaries: from colonial times to the present. Santa Barbara: ABC-CLIO. ISBN 978-1-57607-603-3. OCLC 47927582. Johnston, Henry Phelps (1878). The Campaign of 1776 Around New York and Brooklyn. Brooklyn, NY: Long Island Historical Society. OCLC 234710. Ketchum, Richard M (1973). The Winter Soldiers. Garden City, NY: Doubleday. ISBN 0-385-05490-4. OCLC 640266. Ketchum, Richard M (1997). Saratoga: Turning Point of America's Revolutionary War. New York: Henry Holt. ISBN 978-0-8050-6123-9. OCLC 41397623. Leckie, Robert (1993). George Washington's War: The Saga of the American Revolution. New York: HarperCollins. ISBN 978-0-06-092215-3. OCLC 29748139. Lengel, Edward (2005). General George Washington. New York: Random House Paperbacks. ISBN 978-0-8129-6950-4. OCLC 255642134. Lundin, Leonard (1972) . Cockpit of the Revolution: the war for independence in New Jersey. New York: Octagon Books. ISBN 0-374-95143-8. Ridpath, John Clark (1915). The new complete history of the United States of America, Volume 6. Cincinnati: Jones Brothers. OCLC 2140537. Schecter, Barton (2002). The Battle for New York. New York: Walker. ISBN 0-8027-1374-2. OCLC 50658296. Archived from the original on 2011-02-23. Ward, Christopher (1952). Alden, John, ed. The War of the Revolution. New York: Macmillan. OCLC 254465166. "Morristown National Historical Park – Things to do". National Park Service. Retrieved 2010-04-12. "New York Freedom Trail". NYFreedom.com. 1999. Retrieved 2010-04-12. "National Historic Landmark designation for Princeton Battlefield". National Park Service. Archived from the original on 2009-02-25. Retrieved 2010-04-12. "National Historic Landmark designation for Washington's Crossing". National Park Service. Archived from the original on 2012-10-10. Retrieved 2010-04-12. "Trenton Battle Monument". New Jersey DEP Division of Parks and Forestry. Retrieved 2010-04-12. Boatner, Mark Mayo, III (1974) . Encyclopedia of the American Revolution. New York: McKay. ISBN 0-8117-0578-1. Buchanan, John (2004). The Road to Valley Forge: How Washington Built the Army That Won the Revolution. Wiley. ISBN 0-471-44156-2. Dwyer, William M (1983). The Day is Ours!. New York: Viking. ISBN 0-670-11446-4. Edgar, Gregory T (1995). Campaign of 1776: the road to Trenton. Bowie, MD: Heritage Books. ISBN 978-0-7884-0185-5. OCLC 32971099. McCullough, David (2005). 1776. New York: Simon & Schuster. ISBN 0-7432-2671-2. Wood, W. J (1995). Battles of the Revolutionary War, 1775–1781. Da Capo Press. ISBN 0-306-80617-7. ISBN 0-306-81329-7 (2003 paperback reprint).